AirAsia, the Malaysian low – cost airline know as the world's best low-cost airline which has already running operation of its international routes into Bangalore, Chennai, Kochi, Kolkata and Trichy is all set to break into the Indian domestic aviation space. After its successful operations with a flight from Bangalore to Goa, AirAsia has announced Kochi as their third destination. Kochi has been added in the list after a complete study made by the AirAsia authorities. AirAsia India, the Indian wing of Asia's biggest budget carrier Malaysia-based AirAsia Bhd has become the fourth low-cost carrier in the country after IndiGo, SpiceJet and GoAir. AirAsia will start the second service to Chennai 19th June 2014. With a view to attract first-time fliers, the company has declared a special offer as a part of its entry into the new sector. As a part of the inaugural gift, some promotional seats are available. Passengers who book the seats from 17 – 22 to fly between 20 July and 25th October 2014 will be paid only Rs 500 from Bangalore to Kochi and vice versa. Effective from 20th July, the airline will start daily flights on the Bangalore-Kochi sector. Those who wish to get the benefit of the special seats can book it on www.airasia.com, the official website of the airlines. AirAsia India would focus on connecting tier-II cities while offering fares about 35 per cent lower than the current market rates. The Bangalore-Goa flight cost Rs 900 inclusive of taxes while other airlines charge in excess of Rs 5,000. As a leading low-cost carrier in Asia, the airline services have an extensive network with 87 destinations. Within 12 years of its operation around the world, AirAsia has carried over 200 million passengers and grown its fleet to 150. 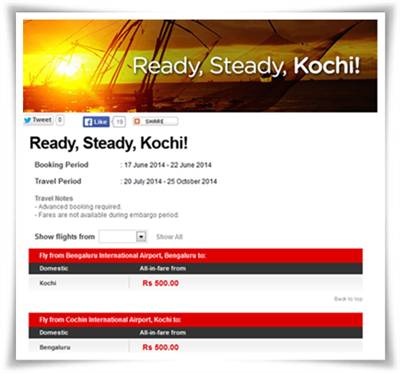 Earlier AirAsia had offered 15,000 promotional tickets on the Bangalore-Chennai and Bangalore-Goa routes.